SPINE is the core – the strength and foundation of a structure. In the body, it ’s the centre of our skeletal system and the conduit by which the sensory information about our world travels to and from the brain. Metaphorically, we think of our spine as our strength of character; and dramatically we speak of the spine of a play being the key question explored, the essential dramatic investigation that holds all the elements of the story and production together. Spine: A Co-Production between Realwheels and the University of Alberta. The spine of SPINE is a question about our rapidly changing understanding of reality. In our contemporary, mediated, and increasingly virtually oriented culture, how do we know what is real? And how do we define what that word, “real”, even means? And the one thing that we usually can count on to be real, our sense of self, our core identity is increasingly harder to rely on. We now browse through endless options of ways to present ourselves and can choose to adopt and abandon what important qualities define us as quickly as updating your profile page on Facebook. So, when reviewing one’s life and thinking ahead to the future, even that notion of a consistent core person becomes elusive. Are you really always the same person? After the births, the deaths, the marriages, the divorces, the injuries, the healing, the lay-offs, the retraining, the relocations, the renovations, the graduations, the retirements, the intoxications, the sobrieties, the revelations of faith, the liberations of skepticism, after starting off on the right foot, and getting up on the wrong side of the bed, after learning new tricks and changing your spots and all those times of not feeling quite yourself today . . . is there anything that remains entirely, unquestionable, consistently, really, you? 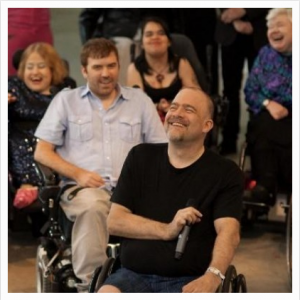 SPINE is the creation of the Governor General Award-winning playwright Kevin Kerr, Realwheels’ founding artistic director James Sanders and award-winning Vancouver actor Bob Frazer, the creative trio that produced the wildly popular action-adventure-comedy Skydive. SPINE takes audiences into a virtual universe where avatars provide a seductive opportunity to reinvent one’s body and soul, free from the boundaries of human physicality and conventional morality. It’s a modern exploration of our changing relationship with our bodies and our notions of identity, truth, and love in an increasingly mediated world. Spine: Digitally changing physical realities. The play also pushes the boundaries of technology, making imaginative use of video screens, three-dimensional projections and actor-influenced soundscapes. “My interest in the technology is to meet the demand of a more contemporary audience, and to try and attract people into the theatre who wouldn’t normally go because theatre is more traditional,” says James Sanders. Sanders plays the central character in SPINE and Bob Frazer directed the production. Frazer is well known in Vancouver as an actor and his performance along with Sanders in Skydive (2007) captivated audiences and critics. The original cast of SPINE featured the University of Alberta’s Bachelor of Fine Arts 2010 graduating class. The play’s development was a collaborative process, with the actors, designers and a technological team coming together in workshops and performances in Edmonton to create and refine elements of the production.